As any cat owner knows, cats will entertain themselves with almost anything. Boxes, rugs, tablecloths, drapes, bottletops, spiders, frogs, iPads – even your hands and feet are not safe. What they DON’T normally play with are the toys you buy them! That’s why it doesn’t make sense to spend too much when shopping for kittytainment. So we’ve compiled this Top 10 list of inexpensive gizmos that cats actually like – your cat is sure to like 2 out of 3, and you won’t feel too bad if Mr. Fusspot doesn’t play with one of his 5-dollar birthday presents. Oh, and while he’s having fun with these toys, your furniture, ornaments, and limbs will be less at risk! Described as “an interactive cat toy designed to charm and not harm”, this tops the list because of its quiet simplicity. At first it seems like a glorified piece of string, but in fact there’s something about it that drives cats wild. My kittens go crazy at it – their eyes wide, their bottoms jiggling in anticipation. The drawbacks? Some people think the material is too thin (cats don’t seem to agree! ), while some crazy moggies seem to be drawn to eating it! My advice to you: if you purchase this toy, only allow your cat to play with it under direct supervision. 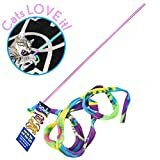 Designed for flat, carpet-free surfaces (all the better for your cat to send careening over the tile, chasing after it like mad), this toy comes in colorful packs of four. What we do is put one in the bathtub and let Mr. Hunter and Miss Uberhunter go at it – once they flick it away it slides right back down creating a feedback loop. Lower maintenance than the #1 pick! Those people don’t understand what’s it’s like having a cat, though. Don’t listen to them! A translucent ball track – the ‘enemy’ runs away and the cat gives chase. The so-called ‘Swiss cheese center’ has another ball to chase, and holes for your cat to make a grab at it. 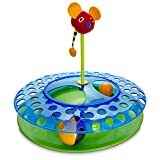 There’s also a plush mouse on a spring that attracts slaps and grabs, but will always escape in the end! This is simply a tunnel, and not a giant underground one that the Swiss love to build. So what’s special about it? Simply that if you bend it, your cat won’t be able to see what’s on the other side, and it will get curious and want to explore. It’s also made of a crinkly material that provokes other cats to come and investigate. As you might guess, this is perfect if you have more than one cat – they will hunt and chase each other, and launch sneak attacks from the openings in the tunnel. Like all toys, cats will use it less and less over time, but this is one that never seems to totally go out of fashion. It’s just a crazy amount of fun. It’s also child-friendly and easy to clean. Pros: A wonderful kitty toy that never fails to delight and entertain. Cons: What it lacks in faults, it makes up for with noise! Now, my cats had a wild time testing these out, but there are a few unhappy customers out there. Because they’re made of plastic, there’s a risk of a cat snapping a bit off and trying to eat it. Putting safety first, only choose this toy if you can keep an eye on your cat while they’re playing. 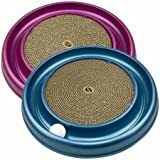 A circular track centered around a scratch pad, this toy is meant to spare your furniture and unnecessary feline encounters! When your cat attacks the ball, the ball will zoom round like it’s in a James Bond movie, and your cat’s paws will end up on the scratchpad, where it will do that cat-scratchy thing that is so cute until it’s happening to your new leather sofa. If you think your cat is a serene, dignified creature, wait till it gets on this for the first time. Mine went bananas swatting the ball around and around and around, while flopping onto their backs and doing it all again. How about some more of those online reviews? Drawbacks? A haughty minority of cats may not find it interesting enough to garner their precious feline attentions. Other issues get sorted out very quickly by the responsive customer service team. 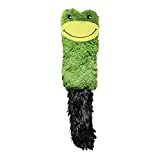 A catnip-stuffed squirrel, raccoon, or frog will be one of your cat’s most trusted and valued companions, being toted around everywhere they go, if you find yourself purchasing this toy. The soft fabric and crinkling it emits only serve to make this your cat’s most treasured item. Just be careful if you have a dog in the house, because they love these toys too. There are some hilarious videos about dogs looking sadly at their owners until they get them back. Cute! This toy stimulates your cat’s senses in a fun way. It’s another ball-in-toy system, but this time not a simple circle. Instead, the ball travels round a circuit as your cats slap at it, and the slightly more expensive version has a wave feature, so that the ball goes up and down to further antagonize the cat! This new version (2.0) has wider tracks and there are more than 100 layouts that are possible. That will help you keep it interesting for the cat over a long period, and rearranging the track is as easy as using lego. You can also buy a ball suitable for night-time play – it lights up and makes itself a juicy, fascinating target for your cats to hunt. 10" longer than the original Play Circuit and enables 100+ layouts! 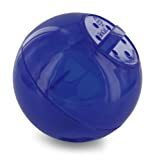 While not technically a toy, cats find this food-dispensing ball just as entertaining as other items on our list, and one genius put a bell inside and began using it as a toy, so its purposes are as varied as your imagination! The Slimcat is a small ball your cat can play with, and as play happens bits of food drop out. Since the amounts that come out are so small, and since your cat will have to work for its meal, this toy helps prevent obesity. And if your cat is the type to hoover up ALL the food going and vomit some of it back up – THIS is the solution. Unless, that is, your cat is both smart AND lazy. That’s right, some clever kitties work out how to lie on their side and gently roll the SlimCat around while it dispenses treats. Another potential drawback is the size of the holes – they may or may not suit your cat’s favorite food/treats. This wooden box looks like a cat version of Connect 4 and works by partially hiding what’s inside. Cats are unable to control their curiosity when it comes to cracks and crevices, and if they know something is just out of sight they get READY FOR ACTION! It’s a well-made product and comes with a couple of toys, though you can use your imagination and throw some other things in there from time to time. Pro tip – use anything with squeaky noises to further provoke your cat. If you’re not sure about this one, you can make a rudimentary version yourself with a cereal box – cut some holes in it and put a ball inside. If your cat is halfway interested, you’ll know this one is for you. Simples!